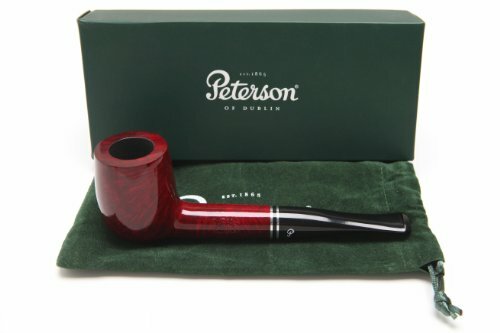 Product: Peterson Killarney 106 Red Tobacco Pipe Fishtail Brand: Peterson Country: Ireland Bowl Material: Briar Finish: Smooth Stem Material: Vulcanite Shape: 106 Package: box Filter: none Length: 5.82 in. / 147.92 mm. Height: 1.95 in. / 49.61 mm. Bowl Outside Diameter: 1.49 in. / 37.99 mm. Bowl Inside Diameter: 0.82 in. / 20.89 mm. Bowl Depth: 1.54 in. / 39.16 mm. Weight: 1.8 oz. / 51 g. *Pipe measurements are approximate **Pipe pictures are not of actual pipe you may receive.